Montenegrin Stitch – Book Give-Away! 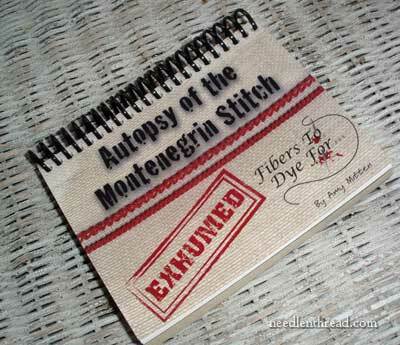 Remember the book I reviewed yesterday – Autopsy of the Montenegrin Stitch: Exhumed? Well, thanks to the author Amy Mitten, I’ve got a copy to give away! If you’ve ever tried to unravel the intricacies of the Montenegrin stitch, especially when it comes to making seamless joins between lines traveling in different directions, then you’ll want this book! Stitchers who enjoy working historical reproduction samplers will find it an immense help, as will anyone who wants to add this beautiful stitch to their repertoire. And of course, if you’ve already got the book (or the first edition), or you don’t think you’d actually use the stitch, there’s no harm in joining the give-away anyway, as the book would make a great gift for a stitching friend. It’s the perfect size for a Christmas stocking stuffer, too! 1. Please leave your comment on this post, on the website – not sent via e-mail or placed on any other post (just follow this link to go directly to the correct comment area). 2. In your comment, answer the following question: Besides using the stitch in samplers, in what other types of embroidery do you think the stitch would look nice? Any ideas or plans? 3. Please make certain that your comment is left with a recognizable name, either in the “name” section on the comment form, or within the body of the comment. 4. I’ll announce the winner on Monday, June 13th, so the give-away closes Monday morning by 5:00 am CDT. Thanks, Amy, for the opportunity to pass a copy of the book on to a lucky reader! June 13, 2011 Montenegrin Stitch Book Winner! I’ve used this stitch in straight lines and love how it looks when completed, especially in an overdyed thread. Since I work a lot on canvas projects, lately I’ve been thinking the stitch would just be perfect for the inner border on one of my painted canvases. But how to turn the corner stumps me and this book would help. This stitch is perfect for lush backgrounds in landscapes (think grasses, or water or clouds! ), and will also give varied weight and dimension to geometric mandala work.It’s a great stitch for giving variety within the structure of a counted-stitch piece. Love it! Thanks for the offer! I’d be working mostly samplers from primary sources, but I have a pair of windows that would look splendid with some hand-stitched curtains that take linear strapwork patterns of the 1500s, and reinterpret them in Arts and Crafts revival style. Hi Mary, I would be interested in this book. Thank you, and thank the author for your generosity. I’m thoroughly intrigued by this stitch which is new to me. I’d love to own this book so that I can incorporate Montenegrin into my needlepoint projects. I had a feeling you’d do just that–a book giveaway! I looked into Amy’s website yesterday and fell in love with some of the sampler kits she offers. I’d love to try the Montenegrin on one of those (after I’ve mastered that maze). After that, I honestly don’t know. I’ll have to think about that. Again, thank you for teaching us so much and for your generous spirit. Enjoy your summer day–keep cool. In your post yesterday you mentioned that the stitch would make a nice edging and I got to thinking about that. I am Jewish and love to create linens for the various holidays like Sabbath, Rosh Hashanah, etc. One of the two main items I make for these holidays are bread covers and table runners. An edging using this stitch and echoing the theme of the piece would be lovely. I was also thinking this would make a beautiful trim on a child’s dress. I would love this book as my husband and I attend historic rendezvous and are really into historic ways of doing things. stitch to use on crazy quilting. This could be incorporated in a crazy quilt. I am sooooo into stitches right now as I have a potential job coming up doing the stitching on a crazy quilt for a famous quilt and fabric designer. I am trying not to get toooooo excited but have ordered a book of a bazillion…lol….crazy quilt stitches and motifs. I would love, love, love to add this to my stitch library. Thanks for the chance. That book looks awesome! I’d like to use the stitch in a multi-media piece I’m doing. I’m completely filling in the (pre-dawn) sky with a variegated blue floss and think montenegrin would be the right choice for the effect I want. I would use this stitch mostly in samplers. Being able to do it in different directions is intriguing and I might try some geometric shapes on dish towels. I would love to have a copy of that book….then I could teach the members of the Canadian Embroiderers’ Guild, London, we have over 200 members, how to do the stitch and enjoy it too. I have been a member of the Canadian Embroiderers’ Guild for over 25 years. Thank you for your wonderful words of wisdom and the pictures you include…you make my day, every day. I think the Montegrin stitch would be a great way to add texture to some simple placemats. Just a few lines of the stitch on each side or as a border. Because of the texture, it would add some character with just a simple design. I’ve tried the stitch before, but couldn’t figure out how to do angles and corners neatly, so I’m excited about the book! I think I would attempt this stitch as a border on a counted canvas work. Notice the word “attempt”. But it is good that the stitch is thoroughly explained in the book and we stay young by learning new things, so learning the Montenegrin Stitch may be the way to go! I was very intrigued by your discussion yesterday. I was very interested in the book, but as you pointed out, it is quite expensive. I am taking Design for Needlework (EGA correspondence course) and am currently doing the lesson on texture. After reading yesterday’s post, I decided to use this stitch in my stitched exercise for this lesson. The book would be a great help and a wonderful additon to my reference library. Oh I want to learn how to do this. Please add my name in the drawing. wouldn’t these stitches be pretty on a runner on an antique hall table or fire place mantle? on old linen and done with hand dyed flosses or fibers? I need the information in this new book as I would like to monogram my husband’s workout duffle bag. Think this would show up better than other monograms. My husband would be very please if I could learn more about this stitch. Here’s hoping. Thanks for the opportunity. I think the stitch would be beautiful as a border for smalls. What a great give-away! Thanks! I would use the stitch as a border to begin with as I’ve never used the stitch before. I can’t think of anything that would be more welcome than a detailed stitch book! I have long dreamed of owning this book, thank you for this opportunity. I believe the montenegrin stitch could be used as a filling stitch, as in filling a border area or leaf. One plan may be to dust off a reproduction sampler I have in stash that was done mostly in montenegrin stitch and consider tackling it. I think the Montegrin stitch would be beautiful on curtains, tea towels, and also a monagrammed heirloom quilt! Let’s see – what could you do with it? 4. edge of an ornament? 5. how about clothing embellishment? I would love to win this book because I’ve been defeated more than once by Montenegrin stitch. I think it makes a lovely border in needlepoint. I’ve never tried this stitch; makes my head hurt just to look at the diagrams in most books 🙂 But the texture is gorgeous and this book makes me think I could succeed! Tone on tone on heavy linen, to make curtains, table runner, pillow or just about anything household is an obvious one. Could also see this on the hem edge of a pair of crop pants, or maybe around the neckline of a pretty summer linen shirt, either tone on tone again, or maybe overdyed threads. Or how about a rich, lovely velvet top embellished with golden threads for the holiday? Think I like this one the best! This stitch would be a wonderful addition to any embroidery, even non-counted if you can sew evenly without counting. Borders and straight bands or ribbons would be wonderful. Besides using the stitch in samplers, in what other types of embroidery do you think the stitch would look nice? Any ideas or plans? In truth I am still digesting the information you presented from the book yesterday. (blushing) I have read the post 3 times now and still looking at the pictures as I am lost to the creation of this stitch. Let alone what you can do it for. This is the first time I have seen this stitch. Although my mother taught me embroidery when I was very young, I am a novice at the type shown here. I can see the stitch used as an embellishment on applique quilts as stems and borders and leaf veins. I enjoy a challenge and look forward to trying it. Thinking outside the box, I can see this stitch used as embelishment on a quilt. Especially one with wool applique, or a crazy quilt. It would make an awesome tree trunk or other raised object. Thanks for the opportunity. I am working on a blackwork piece that could use a border. I think they could complement each other very well. Hi Mary, and THANKS! As a fellow Canadian, I would love to win Amy’s book. The diagrams of the corners look awesome! I would like to see if the stitch could be used to affix items to ground fabric, in a raised button-hole method. Love to see you every morning!! I’ve been experimenting with adding embroidery to my weaving while I’m weaving. This can work well because the cloth is under even tension. And sometimes you can weave in sections of pattern rather than sewing them in. I think Montenegrin stitch would be interesting to try on the loom. But a thorough understanding of its structure would be crucial. Thanks again for your informative blog and generous give-aways! This stitch is so complex that I have never given it a try. I would like to though. I think that it could look great to monogram gifts or when doing crazy quilts it could add that extra character that just goes above and beyond. I am sure that my friend would love to borrow this book from me if I am able to call it my own. I would love to have this! The stitch is such a good stitch to use for borders but I have been experimenting with using it for a filling stitch and it isn’t always easy! This book would be a great help. That book is a must have! It’s so beautiful and all the details. Really want to start to stitch right away if I win that book, Mary! — Lana from Canada. I know very little about thew Montenegrin stitch, but I’m surprised that a whole book(now two books) could be written on the subject. I’ve obviously got a lot to learn and this book would help! The Montenegrin stitch is beautiful as an edging stitch on smalls. This stitch turning corners would be quite a challenge for me, as I am left-handed and seem to have limited spatial perception. I still want to do it—in a rectangular pattern with light-colored thread in the center of a dark tablecloth. I’ve never tried this type of stitching before. It would be a good idea to make a little sampler with some of the samples in the book. I have that type of canvas, that shows in the photo, in the house already. Would make a good temp take a long project. I have a gap in my bookshelf just ready for this book, and a gap in my knowledge for this stitch. I could see myself using the stitch in a knot garden for the paths. Looked like such a great book, I ordered one the same day! I’ve never tried these stitches, but would love to get the hoop out and try them. Who knows what projects they could be blended into. I have a great friend who would love a copy as well. Thanks Amy for donating a copy. I have sued this stitch in samplers and ilike it. It makes great borders. I think it can be used wherever long are cross stitch is used. This is a wonderful stitch. My first extended experience with it was a 17th Century sampler. It ran straight for a while, then on the diagonal. Changing directions is truly a challenge! The book would be a nice addition to my library (and I have a friend who needs to borrow it – so she can finish that same sampler. She has been stuck!). Thanks for all the information you provide and the opportunities to have some great references. I would use this stitch for motifs on my Crazy Qulit blocks! I do quite a bit of Colcha embroidery. Colcha is a stitch developed by the early settlers of northern New Mexico. I think this would make a lovely border for some of my Colcha pieces. What a great book for my reference library! I’m a smocker of childrens and adult clothes and I wonder if this stitch could be combined with smocking. I have a fondness for historic samplers and would love to use this stitch for that also. I like the look of the stitch a lot and have even driven through Montenegro – twice! I’d love to win this. And I might go to Montenegro again very soon, as I’m moving back to that area of the world. I am a MAD collector of books, quilting, embroidery etc. I just love books. Just to own this special one would be a thrill. I’m always looking for new stitches to use in my applique work. I immediately thought of flower stems when I saw this stitch! Ok, so I printed the instruction picture from yesterday and thought …. Wow this looks like a stitch of a crazy person. Of course the challenge is on to see if I can do it….. will be adding it to my spot sampler…. the book would be a great help…. I am planning to use it as one of many stitches in a large circle on congress cloth that I am filling in with various stitches, like a sampler but using stitches only. Other places would be as an outline (stitched frame) for a needlework piece),furniture in a picture, or anything solid like a door, or window frame. I love doing canvaswork as the texture of the stitches is so attractve. I have been making bags by stitching on hessian fabric. so far I have done one in Wessex stitchery and am currently working on one in Kogin embroidery. I would love to try one in Montenegrin stitch. What is the origin of the name? my partner is currently in Montenegro so I take that as a good omen! I like to stitch over some of the handdyed fabric that I make for quilting. They turn into lovely little wall hangings. I think this stich in a variety of colours would be fun to do. It still needs a bit of practise tho. I’ve come across the montenegrin stitch so many times recently. In a sampler, of course, but it is also in a cross stitch pattern I am working on, a little folder design. I think it would also look lovely as a flowing celtic knot. Looking at this stitch reminded me of a project in my “40-year box”; a needlepoint rug in which I used this stitch as the edging. With all the crossover, it really holds down a turned edge. As the project is unfinished, having been put away while pursuing my professional career, one could claim I need the book to remind me how to complete the edging. Would really love to have it. Thanks and good luck everyone. As soon as I saw that it’s “like Long Arm but different” my mind went to “I wonder how it would look as the background for some void work.” So… if I were the winner of this give-away, that’s what I’d be playing with. I would use this stitch to make a greek border on my new dish towels. Maybe some celtic knotwork as well. Oh Mary, I would love to have this book! I’ve tried to work the montenegrin stitch, and it isn’t as easy at it might seem! In addition to using it for samplers, I’d like to add it to garments with other surface stitches. This would actually make a wonderful gift for my mother! opps, forgot to answer the question, I could see these stitches being used on teh hems of little girls dresses, or on tea towels. I embroider my clothes all the time and this stitch would be great on the lapel of a vest or jacket. Thanks for thinking of us! I just finished a wedding sampler for a co-worker using blackwork, so I need a new technique to work on! I would use this stitch for borders and in a pettern on CQ seams. I have absolutely no idea where I would/will use this! Have not seen or heard of this stitch, but the interesting article whet my appetite. Always good to find and learn new techniques, stitches, designs, etc. Thanks for the opportunity. I was so intrigued by this book yesterday when you discussed it — so I am very interested in the give-away today!! Fingers are crossed! What would I do with it? Well, often I think of embroidery on clothing and costumes (historic), that is probably how I would use it. It is so dense and “self-padded” that it looks like a flat braid — but because I would be embroidering it, I can make it go wherever I want it to (which is harder to do w/ braid). Thank you, Mary. Another great giveaway, Mary. Thanks so much. I love the look of this stitch. The first thing I thought of was a border around a silkie in a crazy quilt. What a lovely treat for a blistering hot summer day! When I first read your discussion, I thought I would like to use the stitch for decorative linens- pillowcases, towels, sheets, etc. I can see lovely holiday presents! BUT if i had some grand daughters, I would love to use this stitch and decorate some sundresses. It seems so versatile- yet very challenging as well. Thank you! Enjoy your summer. Now this is a book that I can really use! I have tried this stitch a number of times, both in cross stitch and needlepoint. However, I would really like to incorporate it as a base for a CQ seam embellishment. It makes a lovely intricate border and I can also see it done with some fine braiding. Hope I win! I paid a visit to Amy Mitten’s site and got a chuckle from the “Forensic Study” page. The being exhumed is an accurate phrase. I guess it goes back to the “everything old is new again”. I think the motifs from the book would make great little pincushions or Christmas tree ornaments. It was nice of Amy to offer a book for the giveaway! She has a lovely site and the hand dyed threads are beautiful! Mary, In an EGA meeting not long ago, we were introducted to the very basic of the Montenegrin Stitch for a mystery sampler. Since then, I have used it to edge small and large projects because I like the fnished look it gives. I would love to use the more intricate stitches for a table topper I am working on at present. I dreampt about it last night. I was about 100 years old and working on a tapestry floor frame making huge Montenegrin stitches because I could see them. I had to laugh!!! Thanks for this opportunity Mary! What a wonderful, informative book!! I would LOVE to see a surface embroidery stitch guide book done in-depth like this one!! I, too, like the way it is bound. I USE my books while I embroider. I haven’t heard of this stitch but I will be trying it out now! I collect vintage and antique linens. I try to repair the ones I can. (Thanks for the Orvus tip, BTW!! LOVE it!!) It will be nice to add this to my stitch repertoire! Am very interested in learning another new stitch. I am sure I would use this in a background or some where coverage is needed. Thanks for another awesome opportunity. Mary, At an EGA meeting last year, the very basic Mantengrin stitch was taught to add to a mystery sampler. Since then I have used it on small & large projects because I like the finished look it gives. I would love to use one of the complex versions on a table topper I am now working on. I had a dream about this last night. I was about 100 years old and making a big collage of the stitches in this book on a tapestry floor frame because I could see them – ha! Your generosity is heart touching Mary – thank you!!! I have been working a detailed old french floral border in one armed cross stitch that is coming out so well, it really makes the gridded pattern look fresh and interesting and has such a wonderful texture. I am fascinated by these stitches now! I love the plaited look, and no one knows what it is! I ‘d love to use this stitch on the challah cover I’m working on right now for a slightly different effect than the one armed cross stitch but still have it be harmonious. This is a beautiful stitch, and I think I’d use on almost any thing that needed a sturdier looking border or strip. Now, if I used it curving around in a non-counted embroidery project, would it still be called Montegrin stitch? I meant would it still be Montenegrin stitch. I love the way stitches like this go together. The texture is amazing. I could use it for designs on hand towels. It would make nice borders on any project, like the curtains my great-grandmother made; although, I am not quite that ambitious. It would add great texture to some canvas projects also. Kaleidoscope quilts — fascinating!! The narrow red border is not enough to bring out the tiny red fleck in the fabric. Additional motifs scattered carefully about the surface? What if Montenegrin managed to make it magnificent? Thanks for mentioning it!! I think the stitch would look good on table linens and make them look interesting. The book looks great. Hi – What an intriguing stitch! I always enjoyed counted X Stitch but this is much more involved. I do crazy quilting and this would be very interesting on a block as stitching or a patch. HMMMMM – the ideas are starting! Another very generous giveaway – aren’t you great! I would love to try this stitch in a sampler or perhaps on placements – I think it would look very elegant in a hand dyed thread. I love this stich and think it would look awesome on all types of linens i.e. table cloths, napkins, dresser scarves, finger tip towels etc. I just found your site and read it almost religiously. Thanks for all you do for us. This is a the unusaul wonderful book that collectors would die for. No need for an autopsy as our disease is well known amongst our friends. Compulsion to stitch. This stitch is completely new to me; but when I saw your examples in your review of the book, I immediately thought it’s a must to learn to use in my crazy quilting . . . in all kinds of ways! It has a very individual look. i might try to use it on a felted brooch or fabric book cover; after much study of course! very interesting. I’ve never seen this stitch before (in my so vast experience!) but I think I would like to try it out as a filling stitch in a blackwork sampler I am attempting as a learning experience. I am in the process of designing tote bags for all the ladies in my small group from church to be presented on their birthday. I absolutely love geometric designs and texture. The Montenegrin stitch would be perfect incorporated in each design and done up in their birth month’s colors. Thank you Mary for expanding my horizons and titillating my interests in new “old” techniques and art forms. Looks like a great book to add to my collection! Hope I win it!!!! interesting addition to lefkara-style embroidery. Mind you, sampler usage is a perfectly good usage! I am DYING to get my hands on this book so that I can investigate this stitch further. I have always been frustrated by the difficulty of corners and turns when using Montenegrin stitch, but it looks like this might actually solve ALL the problems. Great giveaway Mary. Thanks. I’ve never tried this stitch but since it has a strong appearance of braid, it could border a placemat or even a collar. I’ll have to give it a try. Thanks for the heads-up. I have been planning to do some alter cloths and this stitch would look great in it as a border. I would use this in reproducing old samplers. I think it would also look good as an embellishment on clothing, along the pocket of a suit jacket for instance, like a braided gimp. I have always admired antique embroidery work that I see in friend’s homes framed on their walls. I have the wall, but alas no embroidery work. I really need to start somewhere. I am about to make a large floral print sundress and I think that some of the larger flowers will be striking outlined in the Montenegrin stitch in a contrasting perle cotton. Just what it needs to liven it up a bit. I’ve used this stitch but only in a sampler. Presently our stitching group is making book marks for a local library and I’d love to try this stitch as an edging around the bookmark or even in an all-over diagonal pattern if I can get the corners right. It’s always fun to do something different. It would make a wonderful apron, placemats and napkins for the kitchen. It fills in more than just a cross stitch design. And a step by step diagram would be lovely. I thought I knew a lot about embroidery but I never heard of this stitch! How wonderful to learn something new everyday. Montenegrin looks complicated and intriguing and challenging – just like the mysteries Amy Mitten must love! If won this wonderful little give away, I might use this stitch as an edging on a hand towel or perhaps a table runner. It looks like fun but would certainly require lots of concentration. A good summer project. Thanks again for the fun chance at a great giveaway. I have no experience with the Montenegrin stitch, but I envision using it on a vestment for my nephew, a Roman Catholic Priest. What a great stitch with which to experiment! This stitch would make beautiful trims and edgings on garments. Experimentation with the width of the stitch and weight/thickness of thread could provide some very interesting results. This stitch gives such a nice texture. I would use it on a bookmark or nametag. This looks very complicated, but I would like to try to learn it so that I could use it on the edges of napkins and table linens. It would also make an interesting fill stitch on pockets of aprons or edges of bathroom towels just for fun. Mary, thanks for the wonderful giveaway and for your daily postings. I look forward to them everyday! The Montenegrin stitch is stunning and puzzling and I would love to master it. I might use it on a pillow or table linens. Also would like to make something for my grandaughter. I used the montenegrin stitch as a border on one of Lynn Tomlinson’s roses. It was a needlepoint piece and it turned out smashing! I used the stitch in a rectangle around the rose, then filled the next space with the stitch used in one of the petals, then put in another row of montenegrin. Margaret Bendig was the teacher who introduced me to this fabulous stitch. So it works wonderfully on canvas. Thanks, Mary, for this opportunity to win a book I would use over and over again. Hi Mary, As a teenager I remember making a Gingham apron in high school. When I saw your post a few days ago on the Gingham Embroidery I thought I would like to make another one. Well instead of cross stitch I could try the Montengrin Stitch you are reviewing today. I would be curious to see if this would translate well into a canvas work project. Hmmmmm? Maybe we’ll see! Might be interesting to try with Jacobean stitchery. It looks like a good border or filling stitch, but for bolder designs or very small areas; unless I’m mistaking the size it could overwhelm delicate work? It might be good for things that need to resist use, like napkins or hand towels. I would like to incorporate the stitch in a quilt . I used montenegrin in a Darlene O’Steen sampler many years ago, and I remember it being somewhat difficult, especially as you turned a corner! NOW I’ve inherited a Mitten kit from a dear friend who took the class, and then was afraid to tackle the entire project! I would LOVE to own Amy’s book; it looks great and I hope she does many more!! I would LOVE this book. I have never done the Montenegrin stitch but would like the challenge of learning how to do it. It would make a great edging on numerous things. I am keeping my fingers crossed. It seems that every stitch is new to me. This stitch is lovely and I could envision using it for edging on an infant blanket. Hmmmm. I would use the stitch on antimacassars as it is bold and robust. This looks like a nice stitch to add dimension to the “stitchery” that I am learning to make in patchwork quilts + embroidery. Thanks for the opportunity. If win, it will be my first embroidery book! I think edgings and borders would look nice with this stitch. Also you could use it for motifs. I think the stitch would be good for edging an article to hide seam joins, maybe when doing crazy patchwork, whitework etc. What a wonderful giveaway. I would use the stitch on a set of needlework smalls, pincushion, needlebook and scissor fob. I would love this little book as I am currently expanding my stitch repertoire. I am making little silk pages (as shown in Effie Mitrofanis’ Threadworks), embroidering them with stitches new to me, which I shall make into a concertina book. Actually I guess that is a kind of sampler! I THINK THIS STITCH WOULD MAKE A VERY GOOD BORDER FOR SAMPLERS, OR FOR HOUSE DETAILS, SUCH A WINDOW FRAMES. I HAVE USED THIS STITCH IN AN AMY MITTEN SAMPLER. IT IS REALLY FUN TO WORK. I believe this stitch would make a lovely border on a sampler. I hadn’t heard of this stitch until you talked about it Mary. It sounds like a very old stitch and I am looking forward to trying it. I think it would look good as a decorative stitch on clothing such as a braid on the hem of a denim skirt or the pocket or collsr of a jacket especially if done in bright primary colours. What a wonderful little book! I have done Montenegrin stitch on a sampler and had to figure out my own way through by trial and error to have tidy corners. I’d like to try my hand at a Chinese knot style pattern (like Celtic knotwork, but with angles instead of curves) and work it in Montenegrin stitch in a heavy thread. I bet it would compliment the pattern immensely. I like to try stitches for texture and natural effects, and so would like to see how it would work as a texture stitch. Another wonderful giveaway! Of course I’d love to have the book. I have limited experience with the Montenegrin stitch – straight lines only, so I’d want to see (and stitch) the examples before coming up with a plan. Some of us are working the Jeannette Douglas “My Stitching Album”, and I want to design a page or so of my own. I’m definitely a counted-embroidery type, and the diagrams can make it easy to learn. I agree with a previous comment that using the stitch in a sampler is a noble enough reason for it’s use. In addition, it would look stunning as an embellishment on clothing. Thanks for continuing to widen my horizons, and make me eager to get back to my stitching! I think it would complete the edgings on linens. I can imagine combining it with drawn thread work or cut work. What a whole new world it would open. Be well worth mastering. I’m not sure how I would use the stitch, but I have been learning a lot of new stitches and this is one that I would like to learn…I think we can never learn to much or be to kind.. thank you for sharing …Rebecca K.
Oh to turn a corner with a Montenegrin!! !A dream come true. I would sleep with a smile. I guess I have been too passionate about turning a corner with a Montenegrin stitch. I keep getting requests for moderation. This is a big deal. Every comment I have made about using the Montenegrin stitch has received a request for moderation. I guess that is my comment. Perhaps this book would help me finish the sampler I have on the go – it got awfully complicated. I think the stitch could be used as a border option. Maybe different color combinations. I like to embellish my quilting and wool projects with stitcheries, this would be perfect for that. What a fabulous sttch and giveaway Mary! I have no experience with this stitch either, but envision seeing it in combination with hardanger on an elegant sampler honoring our ancestors! tenho poucos documentos que registram a pratica do uso da agulha. A NET tem colaborado bastante na recuperacao e disseminacao da informacaos relativa ao bordado a mao.Parabens pelo trabalho que voce vem desenvolvendo atraves do “Needlenthread”! Alem de divulgar o bordado em si, voce tem o dom especial para interagir com os que buscam a informacao.No Brasil existem varios trabalhos realizados com agulha, mas este e novo para mim. I haven’t done this stitch yet but I think it would look good on a pillow or afghan. It reminds me of the stitches on the old chenille bedspreads. Mabe I could put it on a robe of some kind. I would love to have this book and learn this stitch. Years ago I took a class to make a Darlene O’Steen sampler. I have never completed this beautiful piece because I cannot get through the Montenegrin stitch that went in a diagonal direction. I could sure use help and would love to finish this beautiful sampler. I’m not familiar with this stitch but looks like it might come under the heading of serviceable stitches. I intend to test that idea on matching aprons for the granddaughter, her doll and her mum. Good learning projects, using it across the bibs, pockets and skirt hem of dolly’s then some corners too on gdaughters. By the time I’m ready for the mum’s apron the stitch will either know no bounds…or, it’ll have wiped the MontenaGRIN of my face and I’ll be sewing some ric rac on instead! Thanks Mary and Amy. Cheers, Kath from Oz. Iam working on a drawn thread sampler by Moss creek and it uses an intricate type of cross braid close to the montenegrin stitch and would like to learn more. I could see using type of stitch as part of the design element but I would have to purchase the book as it would take a long time to figure out the all the quirks of the stitch. Even when using anothers’ design I often change the colors or the stitches or both to suit my needs. I am trying to teach my 9-yo granddaughter the basics of embroidery. She is catching on very fast. This would be a fantastic summer project for both of us to learn. Thanks for the chance to make this happen for her. I think this stitch would be a great addition to a crazy quilt as a seam treatment…and it seems to be one of those stitches that if made several deep in a wide band with different colors would look fantastic on a collar and/or cuffs of a heavy -ish shirt..or maybe even a heavy knit jacket. at any rate, it will be interesting to see what folks do with it. this stitch is new to me . this would work well on pillow covers or tea towels , i think . It’s a handsome stitch. I could see using it anywhere a heavier (more rustic? richer?) border is needed. I think this would be a nice stitch used to frame /border a miniature floral design. Using this stitch to create a square or multiple square borders around a circular design would give an effect similar to multiple mattings used in framing. The stitch, being so neat and tidy, would be fitting for a miniature. I think it would work great as a border, with different lines of it in different colours weaving celtic-knot patterns. Thanks for offering this draw! I would love to win this book, and if I don’t can you publish where to get it again…I would like to try it as an edging on needlepoint. I would love to win this book. And if I don’t I will be purchasing it. I’ve been over at Amy’s website drooling for the past few days! Being a sampler type person (whatever that is) I mostly think of Montenegrin with samplers. But given it’s geometric nature, you’ve got me thinking outside the box now with applications for hardanger. Could be fun to experiment! I’ve never used this stitch but I do think it would work up nicely on crazy quilting blocks. Also outlining something you want to stand out.I’d really love to win it.Thanks for the chance. I think this stitch would be nice as a border, or as a seam stitch in crazy quilting. I have not tried this stitch yet but plan to expand my stitch knowledge and this looks like a good one to learn. I cannot begin to tell you how much I love your daily messages. I look forward to them and every morning it is, without fail, the first email I open. It amazes me how many different subjects you come up with! Thank you so very much for taking the time to do this for all of us. oh dear, (sigh) I forgot to tell you that I plan on doing one of Amy’s mystery pieces (The Garden Plot Thickens) or an Essamplaire design of Jane Turner 1668. Montenegrin stitch is used quite a bit in those pieces. This is new for me and I find it very interesting. So, ready for a challenge I would use it on table cloths,napkins,placemats, baby quilt,and handkerchiefs, That`s enough variety for now.Thanks for the good give-away. Well I thought of where I would use this stitch besides creating a sampler and I decided I would make a book bag for my grandmother. She is also a big mystery fan and keeps a notebook of every author with book titles she has read. So a book bag with some kind of mystery theme is in order. And also she is the one who exposed me to embroidery so I would like to make something for her with my new found love. I used this stitch in a reversible sampler I made several years ago and found it fascinating and extremely difficult when it came time to change direction. I would love to add this book to my library of stitches and could definitely see using it to replace cross stitches in a Celtic-style cross. I bet it would make an interesting stem or accent in crewel embroidery like to outline a leaf or flower. our guild is currently weaving linen to make tudor style coifs. i think this stitch would be prefect to decorated the fabric after it is woven. the directions are perfect for those corners. thanks. I’ve never seen this stitch before, and lately I’ve become very interested in variations of the basic x in cross-stitch. I can see using touches of this stitch to highlight, to add texture and interest in many different cross-stitch projects, particularly ones with strong geometric lines like the patterns based on Charlie Harper prints. That’s where I’d probably try it out first. And I can see using it when embellishing table linens. Thanks, Mary…think it happened. I’ll still be getting your newsletter though, right? Hi, Dena – no, it won’t affect the newsletter…. That’s on a completely different service! Glad it worked!! Mary: This is a great stitch to use when a strong line is needed on any type of needlework on a countable surface (canvas, linen, lugana, etc.). The texture makes this a very interesting stitch. Janet. Just finished putting together a kneeler my dad made for me and want to make a cushion for it. That stitch would make a great border stitch. BTY do you think cross stitch designs can be rendered in needlepoint if they are simple enough? What a great book. I used montenegrin on a pin cushion, but only a few decorative lines of it. I could not get a nice looking corner so used other stitches for the edging! I can put this book to good use, thank you for giving us a chance via the giveaway. Montengren stitch is a reminder of my ethnic background. My grandmother used to embroider using this stitch in the old country. I’d love to learn it too. My first foray into using it would be to make a pair of lovely cushions. Is it to me to win? I would use the Montenegran stitch for a bookmark, a placemat and a pillow or on a footstool. Merci Mary. Vous êtes mon rayon de soleil tous les matins. My plans include a set of place mats. Thanks for the giveaway! Mary, I would to win a copy of the book it looks lovely. It brought a smile to my face when I read the authors name. A friend called June Mitten who lives on a farm took one of the new lambs to school for the children to look at. One of the thank you letters she received was addressed to Dear Mrs Glove. Mary, I would love to win a copy of the book it looks lovely. It brought a smile to my face when I read the authors name. A friend called June Mitten who lives on a farm took one of the new lambs to school for the children to look at. One of the thank you letters she received was addressed to Dear Mrs Glove. I would definitely use this stitch in crazy quilt applications – it would be perfect as a seam treatment or in a meandering line, perhaps embellished with beads. Another great giveaway Mary! This stitch is new to me. I’d add it to a crazy quilt. And i love mysteries! I like the concept of this stitch and think it would look wonderful if done with Brazilian embroidery threads. The sheen of the rayon threads will make this attractive stitch even more remarkable. I have been gathering ideas t9o make padded fabric picture frames and I think that this would look wonderful. I would use it in needlepoint geometric designs. Thank you for the opportunity for this giveaway. I have used it on smalls as well as samplers. Hope I win!!! Don’t you think enlarging this stitch for use in Gold Work (Smooth Sadi couched perhaps) and/or Silk Ribbon Embroidery would be stunning?! The intricacy of the stitch makes it wide open to “interpretation”! Rows done in Perl would make great cobble stone walkways in a knot garden! I’m planning on stitching a needlebook, biscornu pincushion and a scissor keeper for my descendants, using symbols for clues as to my ancestry. Montenegrin stitch in differing thickness threads for texture will be used as edgings and borders and I am hoping the book will enable me to design the angles for a stylised shamrock, thistle, rose and the letters “NZ” also in Montenegrin stitch. There will be a couple of red herrings. I will stitch “Montenegrin” on the spine of the needlebook just to remind myself of the name of the stitch and will include a stylised maple leaf to acknowledge Amy Mitten. I have also used Montenegrin stitch to disguise the fabric join at the bottom of a sampler I once made! Thanks for reviewing the book, Mary. I’ve not used this stitch before, so I don’t know. But I’d like to give it a try making up something in gift hand towels perhaps. I would use the Montenegrin stitch on a small square scissorsfob, both as a textural detail and for joining front to back. Thanks for featuring this intriguing stitch and for introducing Amy Mitten’s website to your readers, Mary! How generous is that?? Thank you so much, Mary, for reviewing the book, and for holding the give-away. I so look forward to reading your work! Thank you again! Previous Previous post: Montenegrin Stitch – Thoroughly Montenegrin! Next Next post: Needlework Nibble – a Guilt-Free Snack!